Whew! I got a handful of great trailers for you guys this time around so let's not waste any time with my mindless babble and get right into it! First trailer for the evening, we have an Israeli action film titled Kirot. Directed by Danny Lerner, Kirot is the story of two women - the first is an ex-prostitute named Galia, who is forced against her will into becoming an assassin by a skeevy criminal organization. The other woman is Galia's neighbor, Eleanor who is a grocery store cashier that cannot take her awful life anymore as an abused wife. They both team up and escape from there sorrows and together they embark on a campaign of revenge. Has the feel and some of the themes found in films like Bound and Thelma and Louise...you just can't go wrong with a couple of good looking Israeli girls strapped with gat's! Hot on the heals of Dead Snow, there is more Nazi mayhem to come with the upcoming "Nazi Slasher" film, Final Solution - Nazi's really are the new pink this season, aren't they? Directed by Martin Bech, this Danish horror flick focuses on a woman's journey to find out what happened to her family (who were forced to leave her behind) when they fled a Nazi occupied Denmark to neutral Swedish soil. Her quest takes her to places more frightening than she could ever imagine, a place where she and her friends will uncover a Nazi evil of unspeakable proportions. Nazi Slasher sounds like a novel concept and the teaser is pretty cool looking - it actually looks like a French film more than anything else and that's not so bad considering the French have been cranking out some solid horror over the past few years. Next up, Martial Arts legend Yuen Woo-ping makes a triumphant comeback as the director of True Legend. The film follows the story of the classic martial arts character, Su Qi-Er (Man Cheuk Chiu) who lost his fortune and reputation due to a conspiracy against him and his family. Now living the life of a beggar, he takes to practicing Martial Arts and eventually evolves into a master, better known as the King of Beggars. Yuen Woo-ping has not directed anything since 2002's The Tai Chi Master, so it's great to see him back in the director's chair. He has directed some of my favorite Martial Arts films, namely Iron Monkey and Twin Warriors and has done the fight choreography for films like Crouching Tiger, Hidden Dragon and the superb first two entries in the Once Upon A Time in China series - so this is something to look forward to indeed. Finally, and minus the Silver Shamrock song, we have Season of the Witch directed by Dominic Sena. Set in the 14th-century, Season of the Witch is about a group of knights who must transport a suspected witch to a monastery, for she is thought to be the source of the Black Plague. Dominic Sena has directed some pretty weak films, but I still think this one looks promising...and Nick Cage is in it, with long hair no less, and the awesome Ron Perlman to boot. Is it just me, or is the teaser takng a shot at Saw in the begining? At least that's what I got out of the opening statement of the teaser. We'll see if it can rise above amateur level on March 19th of next year. 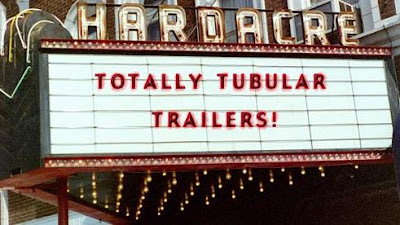 Them was some great trailers, now weren't they? As always, I would love to hear what you think about anyone one of these movies...until then, I'll be watching Roseanne Halloween specials nonstop!